It was an aha moment, in French. 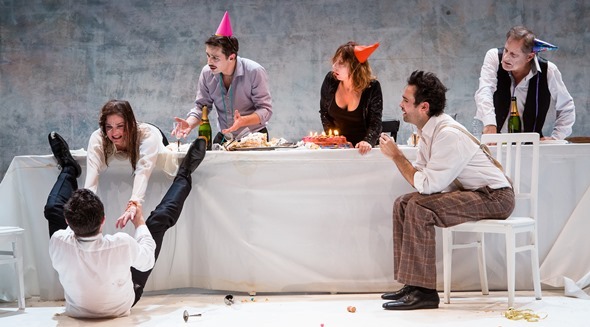 The final madcap flourish of “Ionesco Suite,” the Paris ensemble Théâtre de la Ville’s nonstop 80-minute pastiche drawn from Eugène Ionesco’s absurdist plays, now in a brief run at Chicago Shakespeare Theater, sent my mind reeling back through the decades to my college days. The brilliant little troupe had just whirled through one of Ionesco’s typical flights of associative fancy, where conventional logic is left behind and words are strung together in rapid-fire sequence with scant evident meaning but great expressive inflection. The episode came from “La cantatrice chauve” (The Bald Soprano), Ionesco’s first play (1948) and still probably the most often performed. Like some verbal cyclotron, the seven actors whipped disconnected phrases, words, syllables round and round among themselves in powerful bursts, assertions, declamations – the whole rambling harangue translated into English on the wall behind them. It was dazzling, crazy and hysterically funny: Witness the audience’s gleeful whoops at the finish. I was fully aware of the wide grin on my own mug. This crack ensemble had just delivered what my fellow French majors and I had roughly, if valiantly, approximated in that aforementioned yesteryear. Ionesco’s deconstructed prose is so insanely funny, to read or to hear, that a good dose sticks with you. I would have said his outrageous rhetorical roller-coaster really needs to be experienced in French, but the keenly honed English translations offered here caught the original spirit well enough to keep the house in uproarious laughter. That’s the thing about the Romanian-born Ionesco (1909-94). His assaults on all forms of social convention, completely over-the-top satires, are relentlessly funny in their utter disintegration of rationality. But he was also writing with a sober purpose, and from the sobering perspective of the devastation that befell Europe in World War II. Though Ionesco wrote in French and lived primarily in France, he pointedly occupied a philosophical place outside the imposing circle of the French existentialists and their figurehead Jean-Paul Sartre. Where the existentialists were preoccupied with what Sartre called man’s condemnation to freedom – absolute responsibility for defining one’s self – Ionesco was fascinated by the illusion of certitude in a world where the only certainty was death. From Ionesco’s perspective, to speak of theater of the absurd is redundant: Life itself is absurd; and to make his point, he needed only to hold up the mirror of his plays. He would have said Macbeth has it exactly right when he calls this mortal travail a tale told by an idiot, blah, blah, blah, signifying nothing. Empty, trivial, ridiculous and banal: the sum of human thought, endeavor and aspiration. In that light, the production devised by company artistic director Emmanuel Demarcy-Mota felt both pointed and poignant. Assembled also from plays such as “Jack, or the Submission,” “Two for Delirium” and “The Lesson,” this suite penetrates the veil of language to get at some honest emotions: jealousy, guilt, hubris, rage. In one segment, a student who has difficulty with simple subtraction gets the ultimate bad grade; in another, a fireman swaggers in to do his thing with blazing birthday candles. A mother berates her negligent son. All in a boiling froth of language, fractured and careening. Indeed, the actors occasionally pause to observe how their atomized French is being rendered on the wall in English – and react with a gesture that asks: “Did I just say that?” Now and then, they even speak briefly in English. 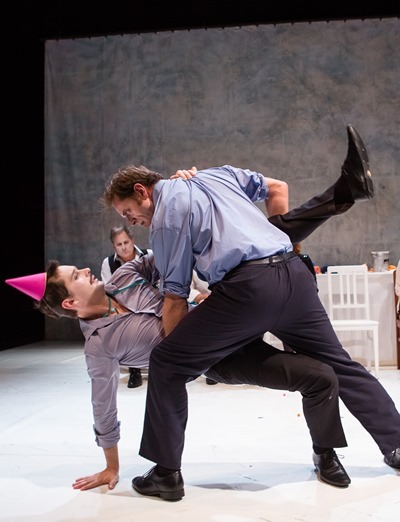 This is also a very physical production, freely – essentially – peppered with slapstick as timeless as smashed birthday cake. In just 80 minutes,the French visitors turn CST’s little upstairs performing space into a gooey mess. But that’s the human comedy as Ionesco beheld it. The cake you see on your plate is really on your face.